Gearge Bareham was in sparkling form in the first of the Ashridge Duathlon series earlier in the month. A 36.27min first 10k put him in to transition alongside Reece Charles-Barclay just behind the leader before Reece put the hammer down on the bike to move away from the field. George was retained second position but in to T2 Chris Penn in 3rd was breathing down his neck before George eased out to 19min 5k to finish in an excellent 2nd overall. Great race and a great photo with Reece and Lucy (who finished 4th overall and won the female race by a country mile!). On the same day back in Poole, Samuel was smashing the parkrun to post his first ever sub 19min 5k – massive improvements for him and we’re looking forward to watching him race in the youth category this year. Fast forward to this weekend and Sarah Janes and Oliver Drew were up in Ashridge again, this time for the national championships. Despite not having done a great deal of speed work yet Sarah was in great form – a good first run (actually a 10k pb and largely off road!) and the bike was going brilliantly before a slight mishap dropping her water bottle which she stopped to retrieve losing a minute or 2. 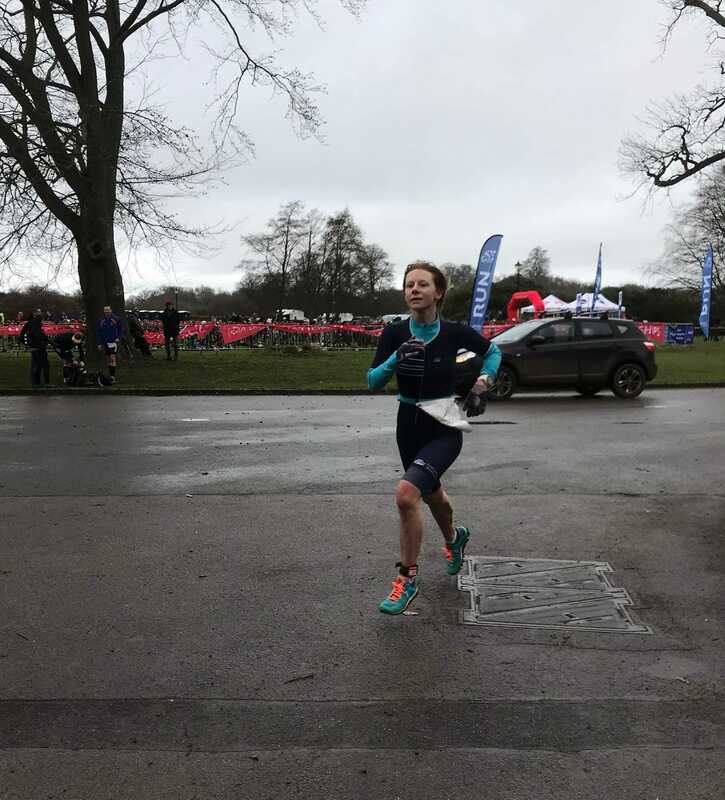 A solid second run followed – great race – although slightly annoying to find she was 45secs off her age group podium in the national championship – especially after the water bottle problem. Oliver had a good run out although it was never going to be a race effort after suffering hypothermia during his epic bike adventures over new year! Great to see him getting it together though and there is a great deal of talent to be unleashed there….. Finally, Mark Holmes – despite the chilly conditions and a busy week moving house – set a new pb of 1hr31min in the Reading Half marathon – awesome stuff!